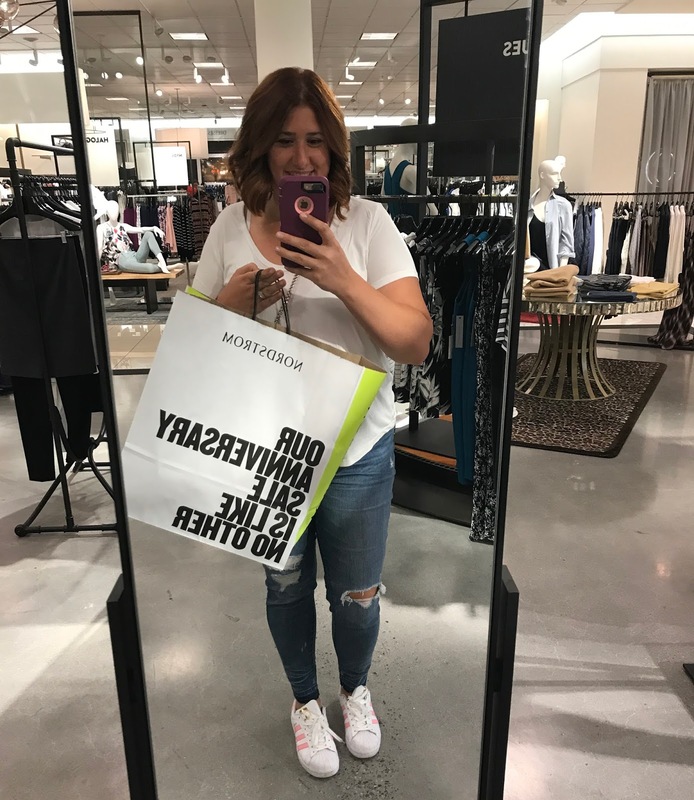 What I wore to the sale: My fav, goes-with-everything white tee and my magic mom jeans you all know and love. And my pink Adidas. 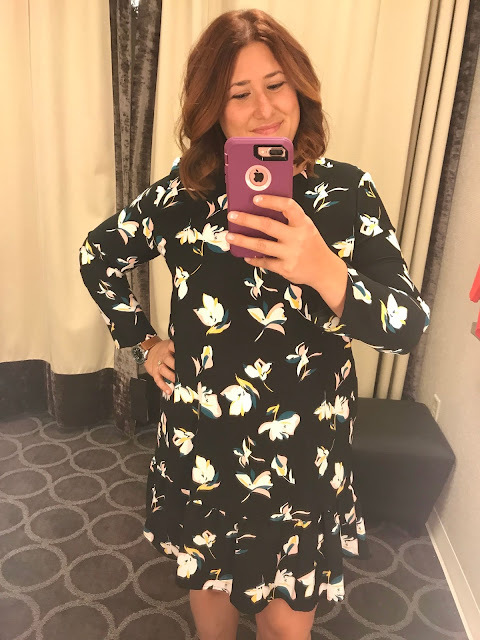 I totally recommend wearing something similar to the sale or any time you plan on trying a bunch of clothes on. It's great to have a basic top and bottom so you always can make an outfit. Nothing worse than walking into the fitting room in a dress to try on a top when you have no pants! Avoid this awkward situation and plan ahead! First up, this red Adidas sweatshirt. I'm wearing a Large and probably could have gone down a size. Its a roomy fit but the color and light material are great. I LOVED this scalloped neck and bottom sweater. It totally has a Kate Spade vibe to it without the Kate Spade price tag! It comes in 7 different colors and I really wanted to try on the yellow, but my store didn't have it so I ordered it. I'm wearing a medium. This top is full of drama. The bow is nice and stiff but still soft and not scratchy so i think it would hold up very well. There is also a good amount of stretch in the top which helps because the back neck zipper required some very bendy arm movements. This is just the perfect teacher shirt. Dressy and perfect for work and would look so cute tucked into a pencil skirt. It comes in this blue stipe and also black and white. 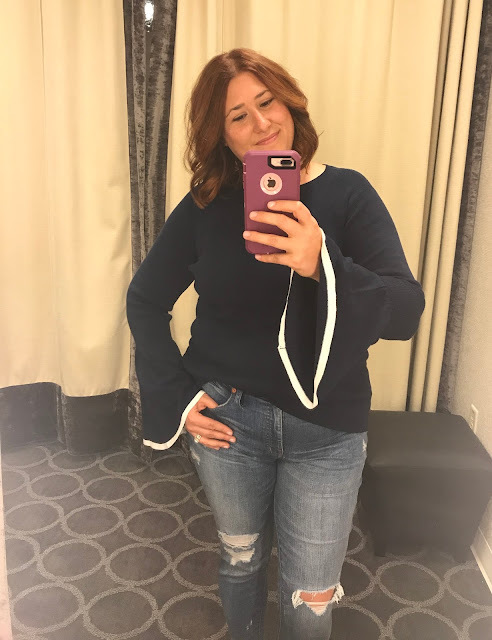 This split back turtleneck by Free People is one I had tried on this past winter but didn't want to pay $70 for a sweatshirt. The sale price is way sweeter and the mint color is so cute! 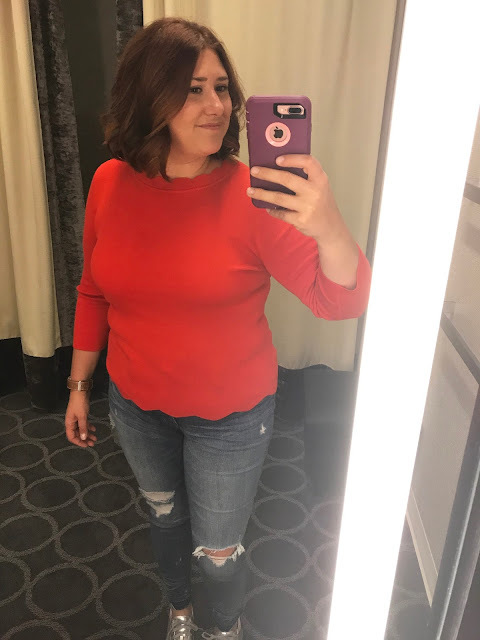 I didn't really pay this sweater much mind when I tried it on, but after seeing it again when I watched back my IG story, I really liked it. It comes in White, Black and Navy. As much as I like it, I don't think it will work out well this fall for teaching. Have you ever tried to write on an Elmo camera with bell sleeves? If so, you probably have ink all over the ends of the sleeves! However if you are just wearing this out and about, I say go for it because it's super cute! This cardigan is AMAZING and selling out FAST. It looks so expensive, is super soft and adds a fun touch to any outfit. 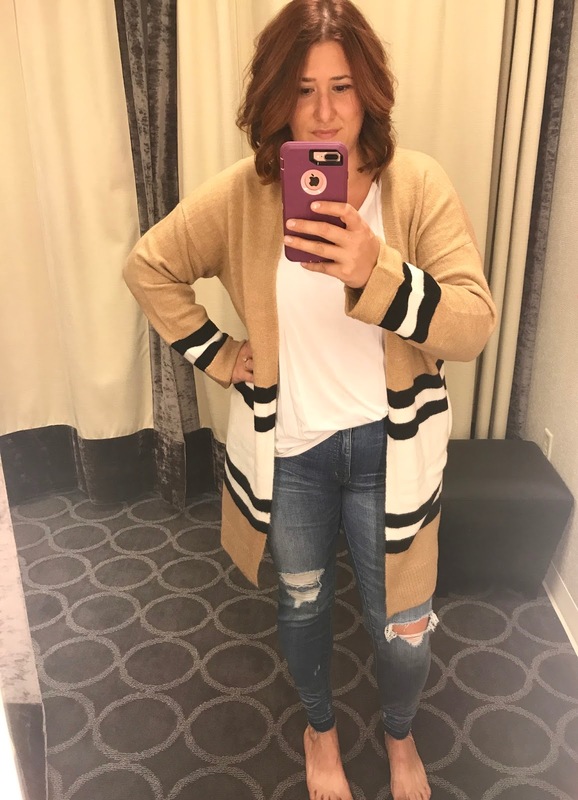 I love that since the stripe is in all neutral colors, You can really throw this cardigan over anything. I think it would be so fun over a printed dress. So last year, Topshop offered a very similar cardigan to this one which I bought and love. The sizing on this one seems to be adjusted from last year's version. I own a 4 from last year and it's huge! 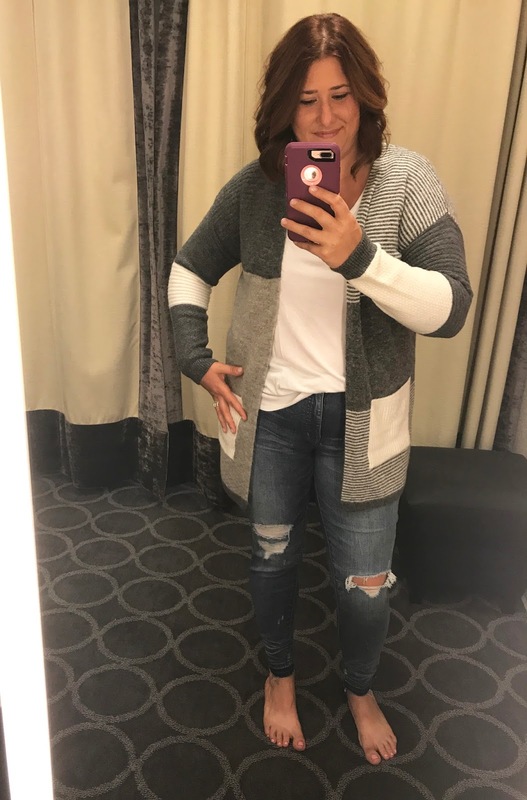 this is a 4 as well and it fit just fine, but I like a looser fit with my cardigans so I'd go up. Didn't have time to try this one on. Truth be told, I put my clothes back on before I saw it was there under a bunch of other stuff. The lace is so pretty on this one but lord knows I have nowhere to wear this to right now. But for just $38 bucks, if you have an event coming up, I'm sure it would be a hit! A statement heel might be great for most girls, but as a teacher, I like to go with statement flats! Comfort is key and a fun pair of flats always get my students attention more than you would think. 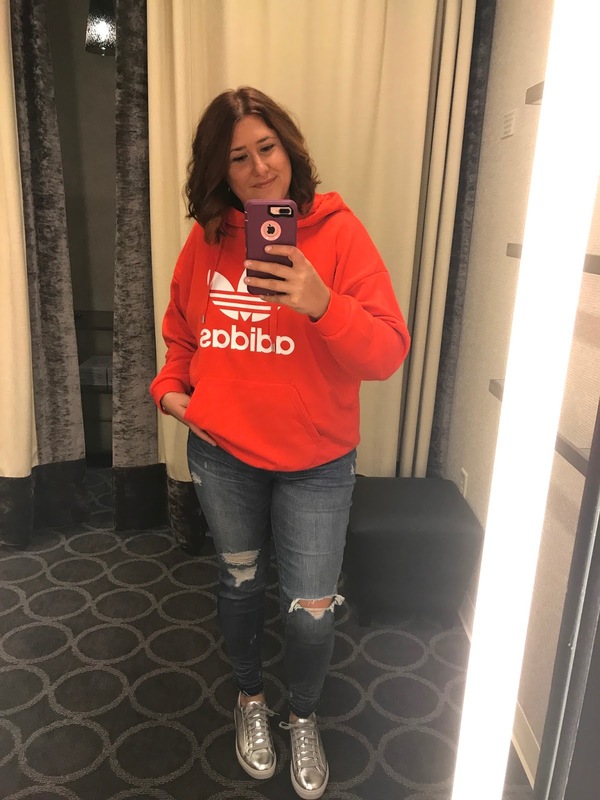 These silver sneakers are perfect for everyday and in my eyes, the silver is a neutral so they kind of go with everything from jeans to dresses! Also let me note how flipping adorable those tiny ear crawler earrings are next to the shoes! They looks totally expensive, like a tiny constellation of stars on your ear. They come in silver, gold, and rose gold! The perfect everyday earring that packs a subtle punch. 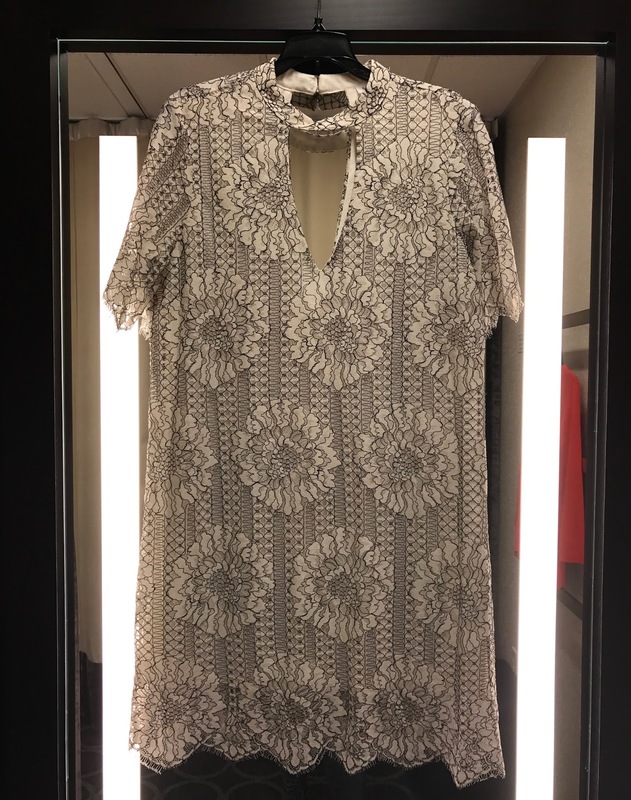 I saw this ruffle hem drop waist dress on two girls in the fitting room and thought it looked so cute on them. Looked kind of matronly on me but I think if you are shorter than me (5'9) if may look cute. 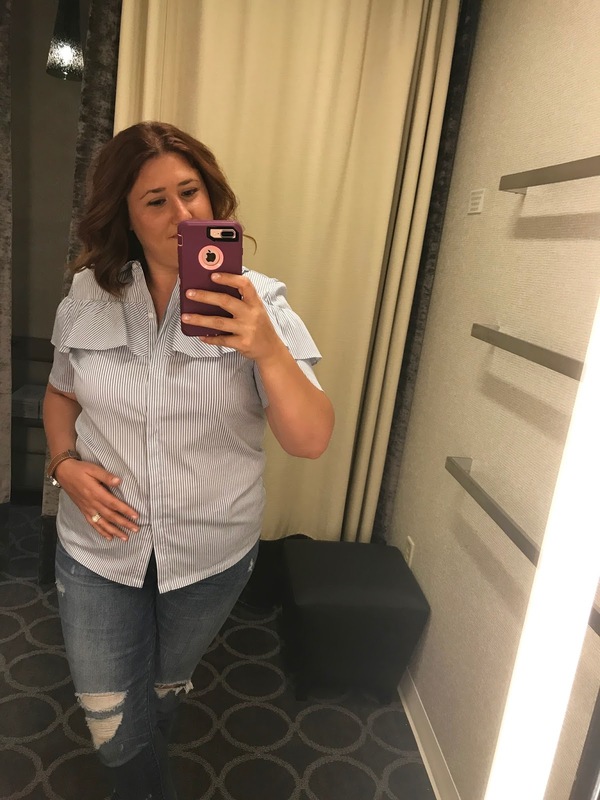 This top is adorable for summer. It's hard to tell but it has a small white pinstripe pattern on it and it has buttons down the back middle. Comes in 3 colors and I'm pretty sure this one is selling out fast! The price is too good to last!